You may have picked some of these up for your yard or bicycle this Memorial Day but did you also realize that you can use this patriotic yard decoration to help your child build oral motor skills? Andrew had a lot of difficulty trying to figure out how to blow air out of his mouth so I was always on the lookout for ways to help him. I found this particular pinwheel at Michael’s and thought that I could have him blow it to make it spin, giving meaning and purpose to something he finds challenging, while incorporating something he loves, spinning! When I used this as a My Obstacle Course station activity, I had him either blow the pinwheel a certain number of times or use a certain number of blows. I found that providing him with a straw helped significantly because it gave his mouth some structure. (We also used a straw to blow out birthday candles. Much more empowering for him to do it that way as opposed to having us do it for him.) This year, we will try it without the straw to continue building his oral motor skills. 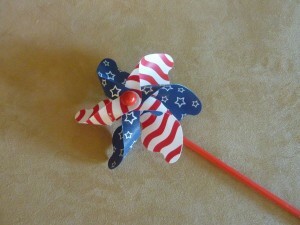 Note: Try blowing the pinwheel before purchasing it because some of them would get stuck or were more difficult to get spinning, which would only cause frustration.